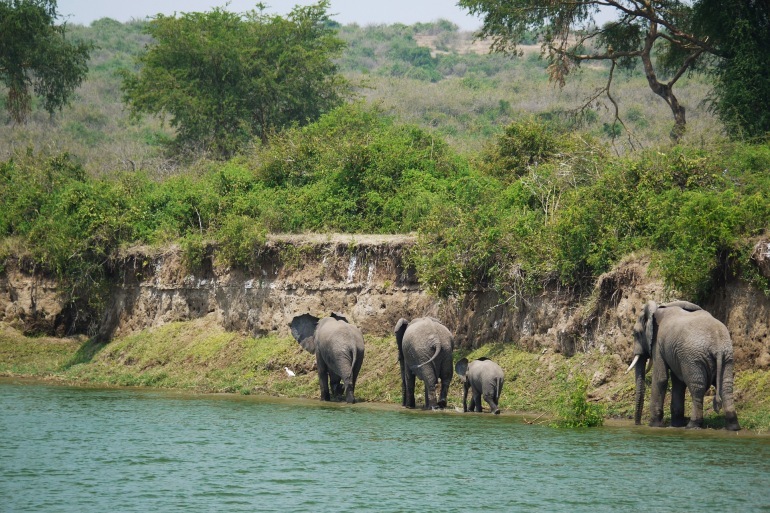 Explore the incredible national parks of Uganda on this adventurous journey. Begin your travels in the lush, evergreen rainforest of Kibale National Park, where you'll assist in the habituation process for a group of wild chimpanzees. Travel onward to Queen Elizabeth National Park to spot tree-climbing lion, pods of hippo and herds of elephant. Venture deep into the dense jungle of Bwindi Impenetrable Forest to spend some time with a family of endangered mountain gorilla, a truly unforgettable experience. Upon arrival in Entebbe, you will be welcomed by your Cox & Kings local representative and escorted to your hotel. The remainder of the day is yours at leisure to enjoy the amenities of your lovely lakeside resort, or just rest up from your travels in preparation for tomorrow's adventures. After breakfast by the lake this morning, fly to Kasese and continue to your luxury lodge with stunning views of Lake Kyaninga and the Mountains of the Moon. In the afternoon, explore the area around the crater rim and take a walk through the forest to familiarize yourself with the surrounding wildlife. Enjoy a full day exploring the verdant landscapes of Kibale Forest National Park, one of the best places in the world to see chimpanzees in the wild. You'll also have the rare opportunity to participate in the habituation of a new group of wild chimpanzee, a process that can take 10-15 years. While you're here, try to spot some of the 12 additional primate species in the park, such as the red-tailed, blue and Colobus monkey as well as the olive baboon. The walking here is also beautiful and the park boasts a huge range of birds, including the Great Blue Turaco. Depart to Queen Elizabeth National Park, which occupies nearly 800 square miles from Lake George in the northeast to Lake Edward in the southwest. One of Africa's premier national parks, Queen Elizabeth National Park boasts a stunning range of wildlife, rugged volcanic terrain and beautiful black-maned lion. Take a launch along the Kazinga Channel, which connects Lake George and Lake Edward, to view one of the largest concentration of hippo in the world. Continue to your accommodations in the less-visited Ishasha region of the park, one of the few places in the world where lion regularly climb trees. Enjoy two days of game drives. Look for elephant, buffalo, kob, waterbuck, bushbuck and predators, including lion and leopard. Bird watching is remarkable, with about 600 species recorded. You'll also visit a crater lake where salt is harvested for export to the Congo. In addition, enjoy the opportunity to visit one of the local communities during your stay. Day 7: To Bwindi Impenetrable Forest N.P. Today, travel to the Bwindi Impenetrable Forest National Park, passing colorful roadside markets and lush vegetation interspersed with banana and millet plantations. Traverse the beautiful mountain landscapes known as the Switzerland of East Africa. Bwindi Impenetrable Forest impresses with its landscape of volcanoes, jagged valleys, waterfalls, lakes and dramatic mountain ranges. Day 8 – 9: Bwindi Impenetrable Forest N.P. Enjoy two morning gorilla treks. Although the hike is physically demanding, and the terrain is rough and muddy at times, the beauty of the forest and surrounding scenery make the trekking worthwhile. The Bwindi Impenetrable Forest, a World Heritage Site, also has other primates and excellent bird watching. Nothing can prepare one for the impact of encountering a fully-grown silverback gorilla. After locating the gorilla family, you will spend one hour in their company before returning to your lodge. If time permits in the afternoon, enjoy additional excursions in the nearby area. This morning, travel to the airstrip and fly to Entebbe. Enjoy a tasty lunch and a day room at the Lake Victoria Serena Resort & Spa. After some time to relax beside Africa's largest lake, bid farewell to Uganda and return to the airport to connect with your onward flight.